Let it never be said that if and when this great old band’s career finally grinds to a halt – presumably a posthumous decision by the surviving relatives of its members – that James ever knowingly took a backward step. Take baiting American President Donald Trump, for instance. Easy enough from several thousand miles away in Britain, but far more risky when you’ve spent the last decade in California, as has Tim Booth, the band’s epicurean singer and always willing provocateur. Living In Extraordinary Times‘ opener Hank takes vicious aim at both Trump and the societal causes of his rise to fame, a song that fights bombast with bombast and leaves few neutrals in the salty wake. Booth’s canon is more usually associated with politics of a personal nature, such as those of the temporarily absent father on Coming Home Part 2, but this is an album that displays far more agitation than the band’s usual benevolent indie rock, a sometimes penitent odyssey with many more contours. 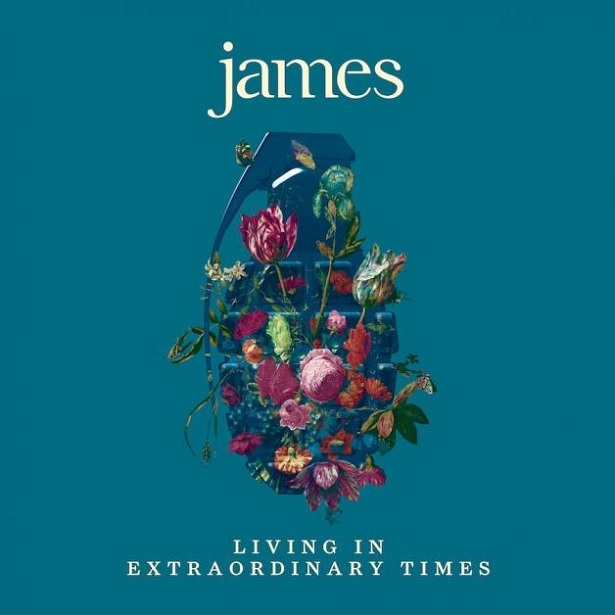 In an elliptical orbit which has taken them light years from the pop world, James are free to set their own course through a world that would make many run and hide. Now it seems lovers and fighters, this latest salvo proves they’re not quite ready for post office queues and pensions yet. Got this one on pre-order. Can’t wait to give it a spin on the table.